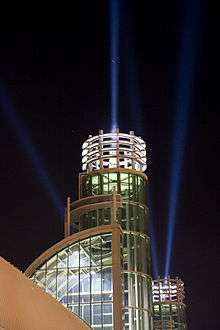 The Enercare Centre, formerly known as the Direct Energy Centre and National Trade Centre, is an exhibition complex located at Exhibition Place in Toronto, Ontario, Canada. It is used by the Canadian National Exhibition and Royal Agricultural Winter Fair and various trade shows. In 2015, it hosted several sport competitions of the 2015 Pan American Games. Located just to the west of the Princes' Gates at the eastern end of Exhibition Place, it was previously the site of a streetcar loop and open space. The new building took over the frontage along Prince's Boulevard and connected to the existing Coliseum and Industry Buildings (also known as the Agricultural Annex), creating a large inter-connected exhibition complex. The existing southern entrance of the Coliseum was demolished and integrated into the new complex. The streetcar loop was moved to the north of the complex. The open space was previously the site of the Engineering and Electrical Building, opened in 1928 and torn down in 1972. Designed by architectural teams Zeidler Partnership Architects and Dunlop-Farrow Architects, the building officially opened on April 3, 1997, with its first show being the National Home Show. It has seven exhibit halls with one million square feet (93,000 m2) of exhibition space. Four of the halls are separated by removable walls to create configurable space. Additionally, the Coliseum and Horse Palace can be integrated into an exhibition. 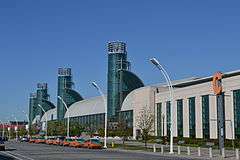 It is the largest indoor exhibition centre in Canada. The project cost CA$180 million, the cost shared equally by the Toronto, Ontario and Canadian governments. The entire southern frontage is a long hall, linking the exhibit spaces with various offices. Most of the southern wall of the hall is glass, providing light to the entrances to the exhibit halls which have no windows. At the eastern end of the hall is a small open exhibition space, sometimes used as an art gallery, used by the CNE for cat and dog shows. At the eastern end of the hall is a "living wall." Under the main exhibit space is an underground parking garage, providing 1,300 spaces, which is connected to the Allstream Centre to the south by an underground tunnel. Along the top of the hall at towers above entrances are four rotating spotlights which are illuminated when shows are being held at the Centre. The external southern frontage differs along its length. The eastern section mimics the building style of the Automotive Building across the street, using masonry and columns, while the western section is steel and glass, described as "flamboyant futurism". To the north of the new addition is the "Heritage Court" hall, oriented west-east, which links the Coliseum, the Annex and the new addition. It is 50,000 square feet (4,600 m2) in size. The western entrance to the complex is at the western end of the hall and serves as the main entrance to the Coliseum. The entrance is mostly glass and has a canopy extending to the west, where a canopy extends to the north, between the Horse Palace and the Coliseum, providing cover to those persons arriving from the TTC loop to the north. The original southern exteriors of the Coliseum and Industry Building, dating back to the 1920s, are preserved inside the hall. The Heritage Court is situated on the site of the TTC rail lines that separated the Coliseum and Industry buildings from the Engineering and Electrical Building. Four of the original "Statues of Industry" which adorned the facade of the Electrical and Engineering Building are mounted in the Heritage Court. Living wall installed for 2010 G-20 Toronto summit. The Annex building is used to store cattle and small livestock during the Winter Fair and the CNE. Judging is done in small rings within the Annex, in the Coliseum and in a temporary judging area in the new addition. The area is also used by trade shows for demonstration space. In 2005, the CNE Board of Directors entered into a ten-year agreement with Direct Energy Inc. to sponsor the name of the centre, effective in March 2006. The agreement pays fees to a reserve fund which is used to keep the centre in a state of good repair. In 2014, part of Direct Energy was sold to EnerCare Inc., including the name-in-title of the centre. The agreement was recently extended for another ten years to end in 2026, at a value of $7.5 million. The CNE Board of Governors and the City of Toronto intend to study an expansion of the facility. The proposed expansion would add an additional hall connected to the west end of the main building. As well as being used as part of the Canadian National Exhibition, it hosts the Royal Agricultural Winter Fair annually. Trade shows such as the Toronto International Boat Show, the National Home Show and the One of A Kind Show are held annually in the complex. The Honda Indy Toronto IndyCar race also uses the hall for exhibit space. The City of Toronto uses various rooms for public meetings. 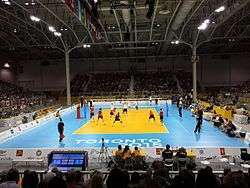 At the 2015 Pan American Games the venue hosted the sports of volleyball in Hall A, handball and roller sports figure skating in Hall B, racquetball and squash in Hall C and gymnastics in the adjoining Ricoh Coliseum. Pan American Games organizers referred to the centre as the "Exhibition Centre". The building was also the location of the Main Press and Broadcasting Centre for the Games (in Hall D). ↑ Dunphy, Catherine (April 4, 1997). "Gala marks opening of showplace trade centre". Toronto Star. p. A6. 1 2 "National Trade Centre / Ricoh Centre". Terri Meyer Boake. Retrieved August 12, 2015. 1 2 3 4 Hume, Christopher (April 5, 1997). "Vast trade centre shows two faces". Toronto Star. p. M7. ↑ Filey, Mike (2000). Toronto Sketches 6: The Way We Were. Dundurn Press. p. 111. 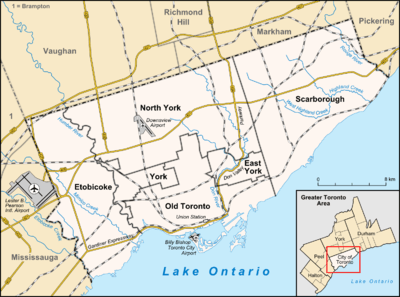 ↑ "Toronto's Direct Energy Centre re-named Enercare Centre in $7.5m deal - ExhibitionWorld". Exhibition World. August 12, 2015. ↑ "Festival Plaza Site at Exhibition Place Toronto Master Plan" (PDF) (pdf). Allstream Centre. Retrieved August 27, 2015. ↑ "Architecture and Urban Design Awards 2000". City of Toronto. Retrieved September 23, 2015. Wikimedia Commons has media related to Direct Energy Centre.